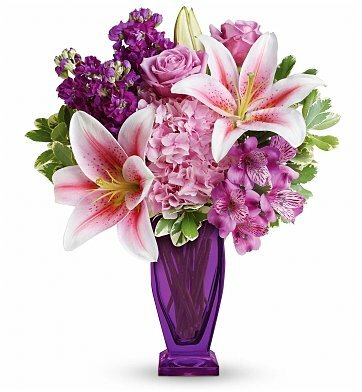 A vision in purple, this spring bouquet features a collection of eye-catching blooms in a keepsake violet-hued vase. A perfect way to celebrate the season! Standard Arrangement Measures 15" x 18". Visions of Violet Bouquet is a hand delivered gift. These gifts are delivered by one of our local design centers located throughout the United States and Canada. Same day delivery is available for most gifts when ordered before the cutoff time. The cutoff time for Visions of Violet Bouquet is 2 PM in the recipient's time zone. I ordered this for my mom, several states away, in the morning and she called a couple hours later to let me know it was delivered. She said it was absolutely gorgeous and big. She will take a photo and send it to me. This is my first time using this florist. I will use this florist again based on how happy my mom was with this arrangement. Beautiful arrangement and fast delivery.